It is once again one of the most exciting times of the year for gaming, E3! 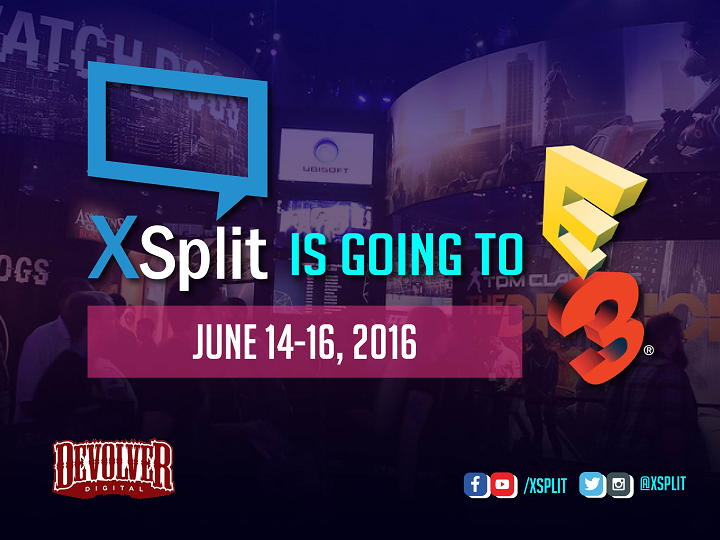 Happening this June 14-16, XSplit will be in attendance for the second time in a row. Our very own @offcast will be coming to help with the production along with our lovely community managers @ugrgaming, @highgai and @burnoutfighter. We will be once again presenting awesome Indie gaming content with Devolver Digital at their BBQ/Indie fiesta across the street from E3! There will be plenty of exciting content and activities, along with some timely announcements so make sure to stop by and get some XSplit swag as well. If you’re not attending, you can follow our updates through our Twitter, Instagram, and Facebook channels. Our main stage will feature Indie[dot]XSplit and Devolver Digital as we will have an E3 tailgate party showcasing various indie developers with interviews, first looks, and more! Tune in to our live stream at twitch.tv/xsplit for exclusive indie game content from special guests as well as chat giveaways. We hope to see you all next week for the fun E3 activities and announcements. The road to E3 starts now!